This looks super cool. The AMS Alpha Omega Nissan GT-R pulling the front wheels off the ground on a launch. In real life, it shows great weight transfer, and this thing is really hooking, however its pretty hard on the driveline. For an all wheel drive car, they may need to put some limiter straps on the front to keep the front wheels closer to the ground. Again, sweet shot. 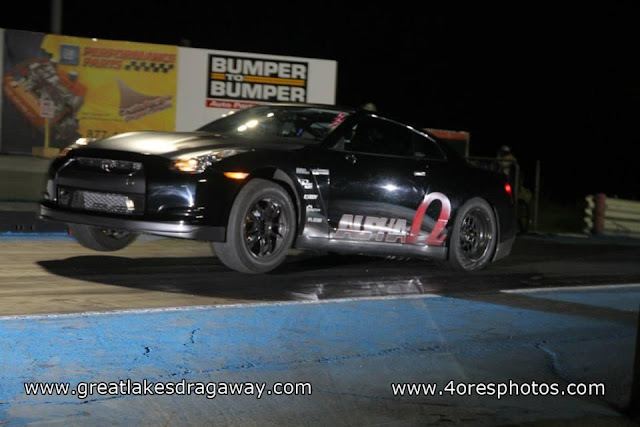 They went a best of 8.66@175 mph in the quarter, showing this thing is making huge power. OMEGA did indeed just go to the track for some testing. Overall the night went well and we learned a lot about the car and our soon to be released upgrades. We've made some changes that drastically increased traction and as a results we pushed past the limits of the driveline components. We will be testing some new parts from Driveshaft Shop that are needed for these incredible launches. These stronger parts are being made and we should receive them soon. Frank and the guys at DSS are consummate professionals and It's been such a pleasure working with them for nearly a decade. They have been a huge help making stronger parts as we continue to push the envelope on the R35 platform. In addition to the axles we also found the limits of our well used Promax clutch. During every pass the clutch slip on the 2-3 shift would cause us to hit the rev limiter for an extended period of time and in some cases actually shut the run down. We never got the chance to make a clean pass but despite the clutch slip we still netted an 8.66@175.3 with a TON of room for improvement and more power on tap. John shepherd and the boys at Dodson are already working on a solution that will go into place in the very near future so OMEGA can run at full tilt very soon.